By booking Zippy Junior for your function in Tuebrook, you will be guaranteed to get a top quality show which will keep the children mesmerised! Zippy Junior’s shows range from a 45 minute show to a show lasting 4 hours. Zippy Junior has been a full time professional entertainer for over 12 years, and performs at over 300 functions per year. Zippy regularly performs and teaches circus skills at schools across the North West, and is currently one of the most sought after and popular children’s entertainers in Tuebrook and the surrounding areas. Zippy Junior’s shows can include magic, a disco, circus workshops, balloon modelling, face painting and karaoke. Zippy Junior is a highly interactive family entertainer, and ensures that everyone will remember his show for a very long time to come! Zippy Junior’s magic shows are perfect for birthday parties as he performs truly astonishing magic right in front of their eyes. 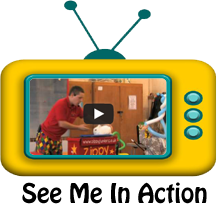 Zippy has lots of interaction in his show’s, with plenty of audience participation.